FARGO, N.D. — The RedHawks have acquired right-handed pitcher Michael Tamburino from the Lincoln Saltdogs in exchange for two players to be named later. Tamburino is 5-5 with a 4.23 ERA in 14 starts for the Saltdogs this season, including a win against Fargo-Moorhead on June 4 in Lincoln. The right-hander has lasted 6+ innings in 10 of his 14 starts and has given up more than five uns only twice this year. 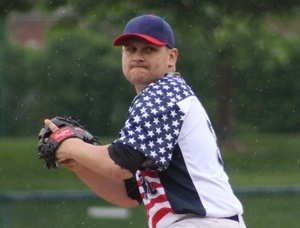 The 27-year-old out of Cedarhurst, New York is playing his third season of professional baseball and first in the American Association after spending the past two season with the Sussex County Miners of the Can-Am League. The Pace University alumnus was 13-15 with a 4.58 ERA in 65 games (37 starts) for the Miners between 2016 and 2017. This season with Lincoln, Tamburino has struck out 71 batters and walked just 18 in 85.0 innings on the mound. Tamburino is scheduled to start for Fargo-Moorhead on Sunday afternoon in the series finale against the Cleburne Railroaders. First pitch is scheduled for 1 PM on Sunday.